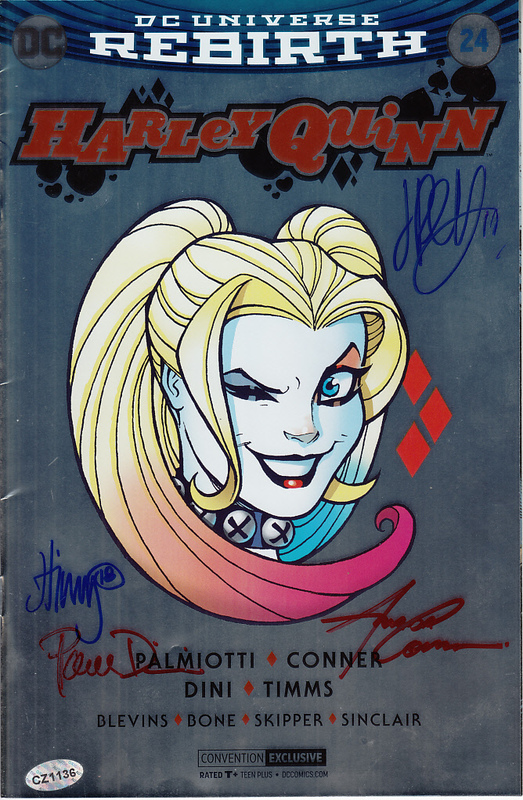 Harley Quinn #24 Rebirth DC comic book 2017 San Diego Comic-Con exclusive silver foil cover variant autographed in blue or red Sharpie by legendary creator Paul Dini, artists Amanda Conner and John Timms and writer Jimmy Palmiotti. 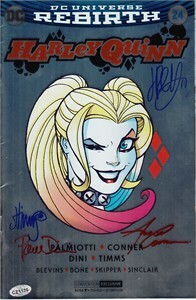 Obtained in person at 2018 San Diego Comic-Con signing (with Dini's autograph authenticated by Cryptozoic's numbered hologram) and certificate of authenticity from AutographsForSale.com. Comic may have fingerprints and other very minor handling flaws but no significant flaws.